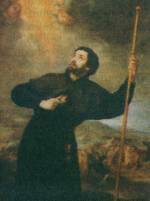 Francis Xavier was born into nobility. As a young man, he was honored as a professor of philosophy at the University of Paris, where he met Saint Ignatius Loyola. In the year 1540, Francis began missionary work which took him from the East Indies to Ceylon, India, Malaya and Japan within a 10 year span. During his foreign mission work, there were several reports of miracles, including healings, the gift of tongues, foretelling the future and even raising the dead. Francis' dream however, missionary work in China, was never realized. He died of a fever with Canton in sight.